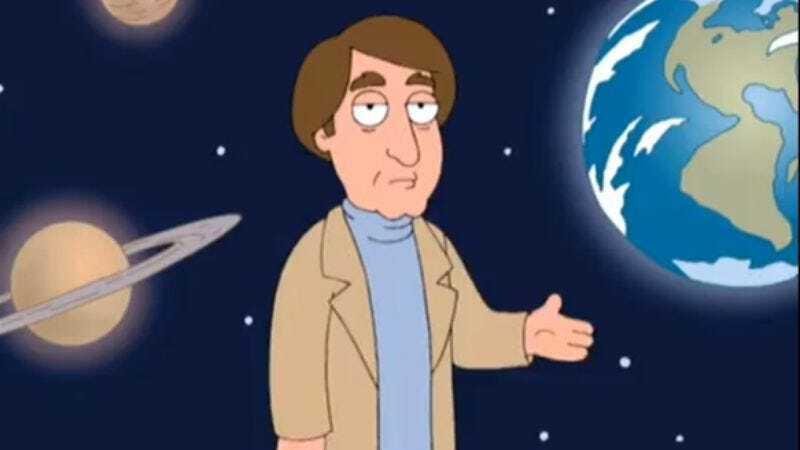 Seth MacFarlane’s gradual takeover of all Fox programming continues, as the network has green-lit Cosmos: A Space-Time Odyssey, both an update of and successor to the PBS series in which Carl Sagan outlined the vast history of the universe, in open defiance of the Story of Creation. The new 13-episode series—which will mark MacFarlane’s fifth project at Fox, after his recently announced remake of The Flintstones—is co-produced by Sagan’s widow, writer-producer Ann Druyan, as well as astrophysicist Steven Soter, with MacFarlane contributing all the hilarious cutaways to God yelling, “Wrong!” See, because that’s the sort of thing that MacFarlane’s shows usually do. Actually, no, MacFarlane seems to be taking this pretty seriously, commenting on the show’s “profound reminder” on the importance of science that no doubt will be embraced readily by a Fox audience. To that end, he’s chosen someone besides himself to host: Astrophysicist Neil deGrasse Tyson, known for his work on PBS, his many appearances on The Daily Show and The Colbert Report, and his perfectly balanced salt-and-pepper hairdo, which hints at the very divine order of the universe that Tyson, a passionate agnostic, so often decries.